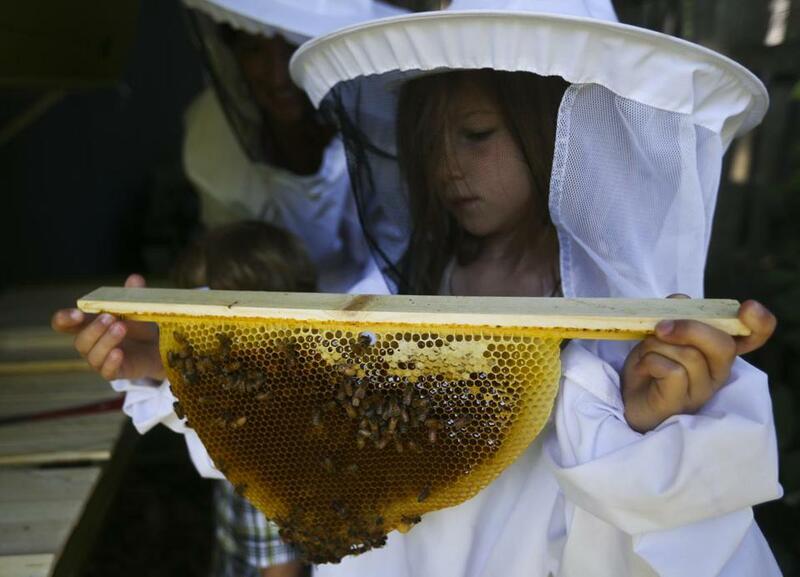 Pearl Neafsey, 6, holds one of the honeycombs from the beehive behind her family’s shed in Newton. There’s nothing like having a pet and saving the world, which has Naida Rosenberger and Randy Souza excited and anxious all at once. Once thought of as pests, bees are now better understood as a pillar of agriculture and ecology, one that has begun to crumble in recent years. As news of bee colony collapse and disease spread, backyard gardeners have gotten involved, and the region has seen a surge in beekeeping. Ken Warchol, one of the state’s seasonal apiary inspectors, said the 3,500-4,000 beekeepers in Massachusetts today represent an estimated 20 percent increase since 2000. “A resurgence of beekeeping — you see that every 15-20 years, but this cycle we’re seeing is tremendous,” he said. Warchol, a sixth-generation beekeeper from Northbridge who has been working as an inspector since 1977, said bees always have a large group of devotees in science buffs, but today’s fans are young couples and families concerned about the environment. Dan Neafsey’s new hives, attached to the back exterior wall of the shed behind his Newton home, are a father/daughter project he began in May with his 6-year-old, Pearl. He said he had hives while a student at Harvard 10 years ago (the university allowed him space on the campus), but now he is helping to nurture these hives (one of which is struggling with an MIA queen) without medical intervention and mite treatment. His years of scientific training may have laid the groundwork for his beekeeping philosophy, but it didn’t prevent him from making a rookie mistake. Though he and Pearl usually wear bee suits when looking in on the hives, he skipped it one day. “I also joined the Google group Boston Beekeepers Association. I made sure I established open lines with beekeepers, asked the group if anyone would be willing to look at my hive and make sure I’m not missing anything. I keep in close contact with people. I don’t try to do it on my own,” he said. The local beekeeping community is as busy as the bees themselves. The Norfolk County Beekeepers Association had a waiting list for its bee school this year, and the two-year-old Milton’s Billion Backyard Bee Project, run by Michelle Urbano, her husband, Ray Wright, and son, Sebastian Wright, has a Facebook following of 500 bee enthusiasts who help educate, share information, and offer guidance to new beekeepers. “Our learning apiary is in our (small) backyard where we have one Langstroth hive (a standard, stacked style) and one topbar hive (a simpler, single-story style with sloped sides). Any proceeds from honey/products of the hive go to sustaining the project and hopefully expanding it next year,” Urbano wrote in an e-mail. The resurgence in beekeeping has spawned businesses to help busy families care for their young swarms. Niles and Thiago DaSilva, who are in their third year as beekeepers, hire Boston-based Best Bees to keep their South End condo’s hives happy on a monthly basis. Inside the kitchen, a visitor could see the fruits of the bees’ labor. Jars of honey, labeled “DaSilva” and dated, filled two shelves. Thiago said he uses the honey as a glaze for chicken or simply as a topping on banana bread. “We send it as Christmas gifts across the country as far away as New Mexico and Utah,” he said. But the bee bounty is dependent on survival, which is dicey, according to Warchol. A combination of factors, among them cold temperatures, mites, pesticides, and starvation, cause the heavy losses. Backyard beekeepers like Rashid Ashraf know the statistics, but the loss is still painful. “It’s like an empty nest,” said the Roslindale resident, whose first hive, which started in 2014, made it through the 2015 blizzards only to diminish, then disappear, during early spring.